Is this the first 'real' smartwatch? What was foretold has come to pass: Sony has announced a new smartwatch, packing water resistance and NFC into its Sony SmartWatch 2. With the SmartWatch 2, Sony is attempting to sneak ahead of the Apple iWatch with what it describes as "a second screen for your Android phone" - a 1.6-inch high-ish resolution screen (220x176 pixels), that is. This means that you'll get phone notifications, an app interface and the ability to control your phone from your wrist all in one neat little package. You'll be able to handle calls, check maps, read emails (as long as you've previously downloaded them and have, let's face it, pretty solid eyesight) and control music playback through the SmartWatch 2. You can even take photos through your phone with a dedicated smart camera app - next level selfies coming to an Instagram account near you soon. Although it's a Sony product, you'll be able to use the SmartWatch 2 with "most" Android tablets and smartphones, not just the Xperia line-up. There'll be interchangeable 24mm wristbands to choose between and the whole shebang is dust- and water-resistant. 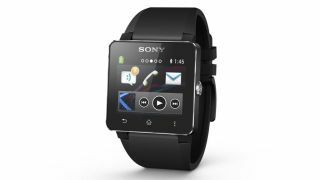 While the Sony SmartWatch 2 has a release date set for September 2013 in other regions, we can't say for sure that Australians will have the opportunity to get a hold of it then. A Sony Mobile spokesperson told Good Gear Guide that though the smartwatch has been confirmed for Australia, "we will confirm details around the date, carriers/stockists and pricing at a later date". Also announced today was Sony's insanely huge phablet, the 6.4-inch Sony Xperia Z Ultra.